45 CFR 46.111(a)(3) requires that the IRB ensure that researchers employ equitable selection methods when enrolling subjects. Equitable selection does not mean that all groups are represented in proportion to the population. It means that selection criteria should be both fair and appropriate to the research question. Research aimed at eliminating the risk of lead poisoning will by its very nature include more economically disadvantaged and minority subjects. A commonly seen error is for the protocol and application to state that no subjects will be excluded from the study but to then fail to include a process that will permit non-English speaking subjects to enroll. It is important to determine prior to IRB submission whether or not it is appropriate and possible to enroll non-English speakers as subjects. Non-English speakers are potentially vulnerable because it may not be possible obtain a valid consent due to inability to fully comprehend the nature of the research and the risks and benefits of participation. The IRB may either conclude that it appropriate or inappropriate to include non-English speakers as subjects based on the circumstances. When should studies include or exclude non-English speakers? Studies that offer a prospect for direct benefit, especially Phase 3 confirmatory trials targeting serious or life-threatening diseases, should generally make the greatest effort to enroll all eligible subjects. The fewer the treatment options and the greater the potential prospect for benefit, the more important it is to make the benefit of participation available to all. It is easier to justify exclusion from early phase clinical trials where isn't strong evidence of efficacy, clinical trials that are greater than minimal risk without a prospect for direct benefit (e.g. many PK studies), and studies that are minimal risk but without any prospect for direct benefit. It may not be possible for non-English speakers to participate when the study requires completion of surveys, questionnaires, tests, diaries, etc. that are not available in other languages. Some tests are not validated in any other language than English (or Spanish). Expectation based on experience that non-English speakers will rarely present to the clinic where enrollment will take place. If non-English speakers are going to be included, consent be accomplished and documented in one of two ways. A translated version of the IRB-approved consent form that the subject can read can be used along with a translator who is fluent in English and the subject's native language. The translator can be a family member, friend, member of the research team, or a volunteer or professional translator. Likewise translation of the consent document may be performed by a commercial service or by a member of the investigative team or a colleague that is fluent in both languages. For more information see IRB SOP 701: Required Elements of Consent and Documentation of Consent. The expense of translating consent forms using commercial services and the need to pay for translation of all modifications to the consent is an impediment to including non-English speaking subjects. The short form consent process is a very cost-effective alternative to using translated consent forms. It is intended for situations where few non-English subjects are anticipated. See the IRB's webpage Short Form Consent for a detailed description of what is involved. 45 CFR 46.111(a)(3) requires that the IRB determine that the research will ensure equitable selection of subjects. The census data from the city and region are useful for determining what the expected distribution of subjects should be for clinical research activities conducted at CHOP. 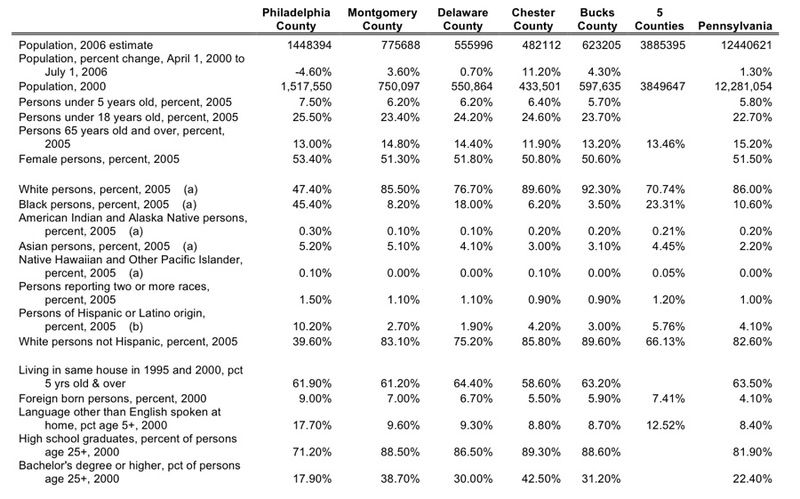 Examination of the census data from the greater Philadelphia region (below) shows that less than 10% of residents are foreign born. An even lower percentage are non-English speakers. In clinics that draw patients from specific regions the percentage could be much lower or much higher.